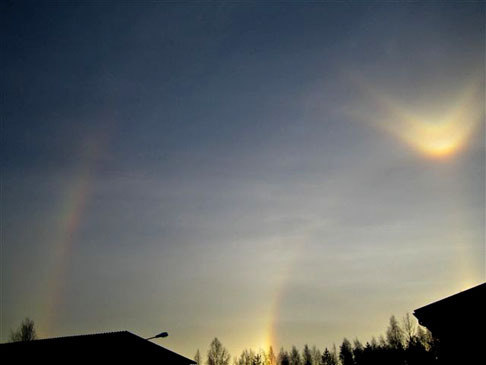 This display was photographed on 4th December by Liisa Eronen in Kulho, Kontiolahti, Finland. The temperature was around -4°C. Nearest ski center is located about 10 km away, so most likely this was caused by snow guns. I merged the two images together. Thanks. I tried the same but deleted it. Which was good - you did better. Got some more info from the photographer and edited the post accordingly. 2 Dec Aho had a nice display in Himos, 3 Dec Mikkilä the monster column display in Sotkamo and now this 4 Dec in Kontiolahti. Nice row! Nice low sun display indeed I can see faint arc rising up from parhelion and curving towards where the upper suncave parry would be. Believe it or not I have been photographing halos for 10 years and have only gotten two nice example of convex parry. The one time I got simultaneous concave and convex parry arcs which is a rare catch along with elliptical halos. I think 2009 was the best halo year for me.